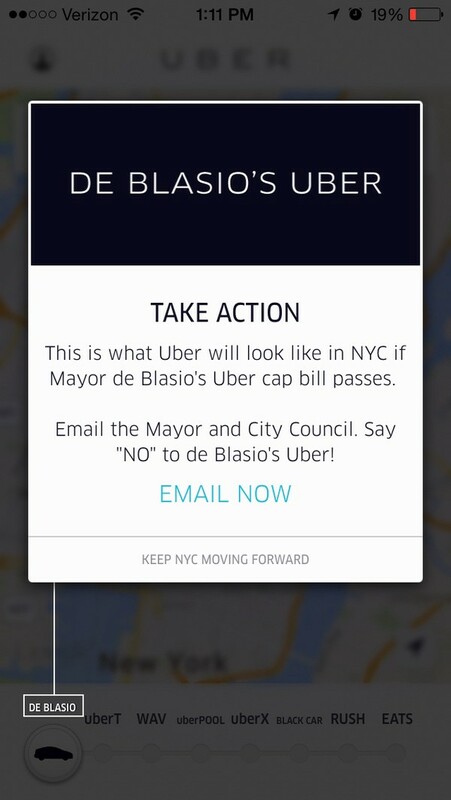 New York’s Mayor Bill de Blasio has been obliged to withdraw his plans to impose limits on the activities of Uber in the city following a an impressive media campaign by the company that has included full-page advertisements on The New York Times web site and an option on the Uber app called de Blasio (in the picture) that invites users to take action against the Mayor’s plans. A number of high-profile celebrities have thrown their weight behind the company, among them Kate Upton, Neil Patrick Harris or Ashton Kutcher, who have inundated the social networks with hashtags such as #UberNYC or #UberMovesNYC. At the same time, the company has published detailed information about its activities that supposedly show it doesn’t contribute to traffic gridlock. Quite simply, the Mayor has buckled under the pressure and agreed to negotiate a deal with Uber that involves carrying out a four-month study into the impact of the company’s services on the city. At the same time, the city’s taxi magnate Evgeny Freidman, has said in a bankruptcy application that his dozen of taxi companies are going under, mentioning Uber on 21 occasions. Despite regulatory obstacles, the companies involved in what has become the sharing economy continue to attract the interest of investors and are threatening to go public, and thus attract even more investment. This heft, linked with careful planning is converting them into powerful influencers in public life in the United States, to the point where they will play a role in the upcoming presidential campaign. Opposing Uber, Lyft, Airbnb and others like them is not only going against tens of thousands of ordinary people who earn extra money through them in return for flexible working conditions, but also against potentially millions of satisfied customers who use these companies’ services. The situation in the United States contrasts with that in Europe, where these types of companies have been around for less time, and have impacted on the lives of fewer people. The company has taken the suspension on its activities in Spain to the European Union’s Tribunal of Justice, which will issue a ruling next year. For the moment, the question seems clear enough: for politicians, publicly opposing these companies is a vote-loser, making them look like enemies of progress and protectors of special interests. Once a critical mass has developed, being hit by a campaign like that in New York is a major headache for any elected official. And Uber has shown that it knows how to use the media to its advantage. We should be in no doubts as to where all this is going. At a certain point, situations tip, and the party that once seemed weak suddenly becomes strong. If you think that this is all going away because of a couple of court rulings against Uber, you’re wrong. The tipping point is close.